The pictures are cute too! Could you please explain a little more on what it means when you say " She is now at -3.5, +1.50, 100 in her right eye, and -8.75, +1.00, 055 in her left eye" I mean expand on the three measurements also + - in the same eye, I am a mom to a micro preemie who has a eye appt coming up in two weeks, Thanks in advance. The first number shows how nearsighted she is, the second show the degree of astigmatism, and the last is the "axis" (not sure exactly what that is except that I think it has something to do with where the astigmatism occurs in the eye). With her glasses on I think the doc said she can "read" pictures at 20/40 with each eye. This is good news because at the last appt she was at 20/40 with her good eye, and something like 20/70 with her left. I am not so good with the 20/20 numbers. John and I both wear glasses so I am more used to the + and - numbers that we have always seen. It helps give me a better frame of reference. John's eyes are worse in terms of nearsightedness (I think he's about a -4 or -4.5 in both eyes), but I also have astigmatism in both eyes in addition to being nearsighted (-2.5, +1.00 or around there). HTH! Good luck with your appointment. Thanks for the update, Billie! I always love to hear how the girls are doing. I am especially excited to hear about how well preschool is going. It sounds like it has been a very positive experience, which is so refreshing to hear. The pictures are incredible, too. Sometimes, I just take a look back through your site and I am amazed at how far your girls have come. You and John have so much to be proud of and thankful for! I cannot even express the gratitude I fell that you have openly allowed the world to watch your family go through, what must have the hardest few months/years of your life. I am a micro-preemie mom of twin girls. Born August 2007, two days apart at 23 5/7 & 24 weeks even. We spent 5 months in the NICU @ Childrens Hospital. I found your site a few weeks after I had the girls and have follow ever since. My daughter Grace is also very nearsided (20/600) and her twin sister Faith has bilateral hearing loss. Profound in both ears. We too are going through the cochlear process. After grieving the loss of my child having the ability to hear I realized you must have some answers on your site about Eden. I have read every single blog you have ever posted here. And the way to have updated your progess with Eden's hearing loss/cochlear has helped us in a way I think no other person could fully understand except that of a preemie mom. My girls are now 15 months old. (corrected they are almost 11 months) They are off oxygen during the day but still need 1/4 liter at night. I want to thank you. So much. For your ability to keep this blog going and for having the strength to open it up for everyone to see. I truely LOVE that I can keep coming back; to maybe get some sort of perspective on what is ahead for our family. Glad that school is going well, I get this huge lump in my throat just thinking about sending Kellar when he turns 3. H & E seem to be doing well w/what all they know, I was actually going to go on pbm and ask what all they *should* know at 2 1/2. Kellar sounds a lot like the girls, I think he's going to have a hard time w/things like writing and having to really use his hands, I'm not sure if it's so much his hands as it is throughout his arms, they are just so uncoordinated at times. Is worsening eyesight something that's fairly common, Kellar is -3.5 in his rt eye as well. Glad all is well and love all the pics of the girls, they are growing up so quick! What a great update! The girls look awesome. I started reading your blog last week, and have read all your posts (yes all of them!). I'm so glad to hear that your girls are doing great. 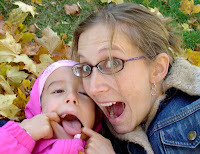 I stumbled onto your blog from a link someone left on the preeclampsia foundation site and have thoroughly enjoyed it. My own daughter was stillborn at 25 weeks, 4 days due to early onset preeclampsia in January 2007. She weighed 420 grams(14 oz), and I often wonder what life would have been like for her had she lived. I've probably already said this, but I'm not sure so. . . They were SO worried about Charlie's weight that we HAD to have a feeding tube. Used the stupid thing for three months and I kick myself about the un-needed surgery. Then, they were worried that he was gaining too fast. Now, we're back to worrying that he's too thin, but he eats and that's all that matters to me. Our kids burn a lot more calories than other kids just doing everyday stuff. Sometimes I feel like they're just looking for stuff to worry about. Great update on the girls. I have to agree with you on the Child Rite seat. I bought one for Elvis and, while I LOVE it, I spend a lot of time carrying it between home/school. And it's not really easy to carry. It is, however, easier to carry than to fork over the money for a second one. can you open up a way for people to leave donations for another bumbo-esque seat for eden to use upstairs? you can say it was my idea -- since it is. i'd love to chip in a $20 for a seat. she looks so happy in it! i'm really happy to read all the great things about school. as a former public school teacher, i am relieved to hear your system is, for the most part, rallying for your girls. I love watching your girls grow up. 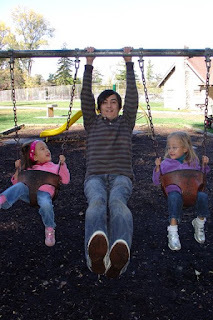 When I first started reading your blog they were a litle over a year old, now they are four. Billie, I am so inspired by this blog and by the girls' progress. And, thanks so much for mentioning the Child-Rite chair, I hadn't known about it. Once good chair deserves another: Do you know about the Kekaroo chair? www.kekaroo.com (sorry, I can't figure out how to link blog comments yet). It provides excellent support, I will post a blog on it at some point, I'm sure, because it's been so helpful with feeding! 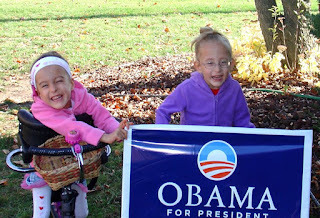 I am NOT an Obama fan, but I AM an Eden (and family) fan, and would also donate a little toward another seat for her. Please post if you can set something up, maybe like what you had for MOD? I'm glad everything's going well for you guys. I am so glad to hear all of the good news. The girls always look so happy in every photo. They are a constant ball of smiles. I am so glad that school is going so well for them, they will be great! Thanks you so much for a detailed post. I was wondering how well they were doing! After seeing Eden in her Childrite seat I ordered one for my kiddo for Christmas. I can't wait to get it. And I also nominated you for a blog award. Smooches all around to everyone. You have two beautiful miracle children! I was left deaf after my early birth. It was not as early as Holland and Eden's. I also have a cochlear implant. Yeah! What an amazing positive and wonderful news filled post! So glad to hear all of it! Your girls are just darling! I love seeing pics of Eden in her cool chair and the adorable head bands you use to keep the CI on! Smart! I really appreciated that you posted about the child rite chair you bought for Eden! We have been using the Bumbo for 5 years now and our daughter is getting too big for it. What a perfect step up and I think this will work even better b/c of the higher back. Thank you! Now we know what to get her for Christmas! I enjoy following your girls' progress.. they are amazing!